Uchi kento and soto kento are registration marks that determine the position of the paper in woodblock printing. A registration mark carved within the woodblock is called uchi kento while one carved into a separate wood board, known as a kentoban, is called soto kento. 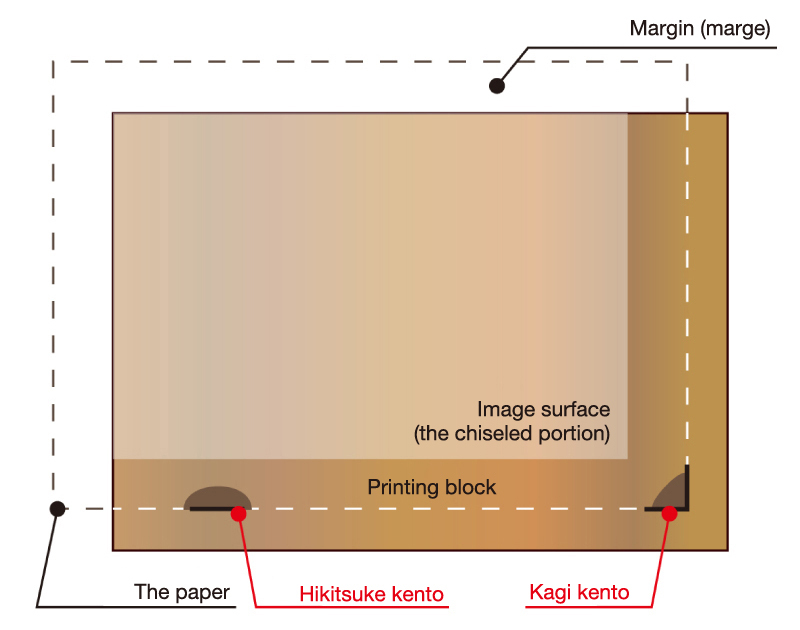 When using uchi kento, the block needs to be larger than the size of the image plus the margin. Therefore, this method is not very suitable if you want a large margin. If creating a work with multiple blocks and colors, registration marks will need to be carved into all of the blocks. Because it is carved into the same block, there is no concern that it will move and it is said to be more precise than using soto kento. 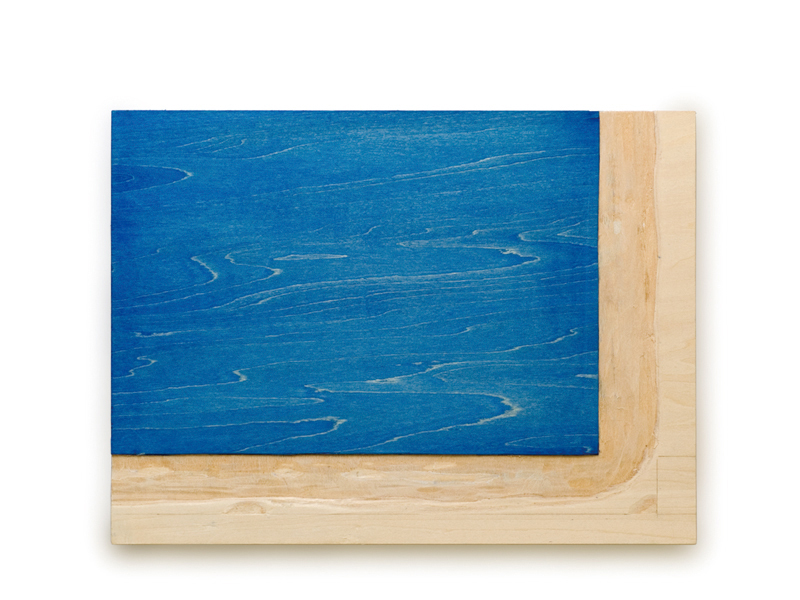 When using soto kento, it is carved into a separate wooden board. The board is called a kentoban. 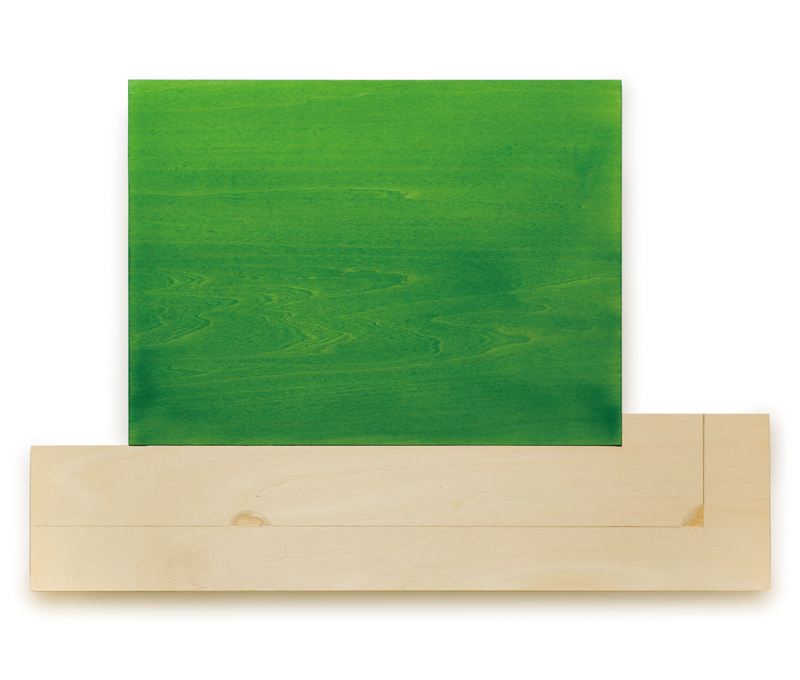 The kentoban is cut into an L-shape with the same thickness as the block so that the inside corner of the “L” fits snugly into the corner of the block. 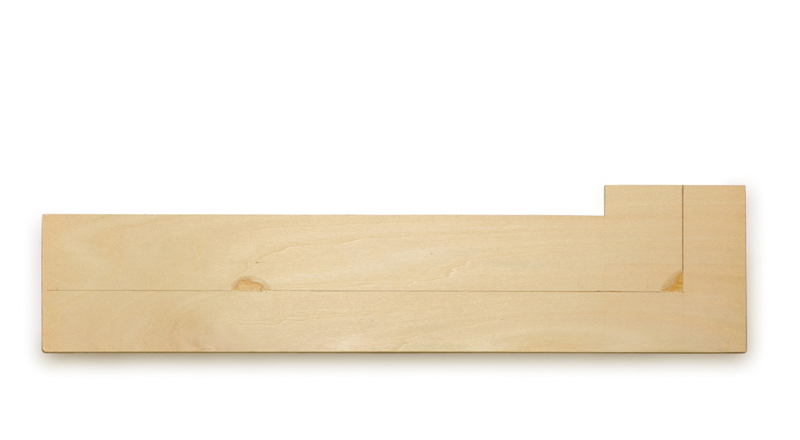 The soto kento has the advantage in that there is no need to carve a registration mark in each block when using multiple blocks. However, if the inside corner of the L-shape on the kentoban does not fit snugly into the corner of the block, there is the possibility that the printed work will be out of alignment, so care needs to be taken. Both the uchi kento and the soto kento normally comprise a L shape registration mark on the lower right hand side of the block, called a kagi kento and a straight line registration mark drawn across underneath and to the left of the center of the block, called a hikitsuke kento. Both of these are carved with a sharp instrument called a kento chisel with a flat blade that can cut a groove of about the thickness of a sheet of paper. 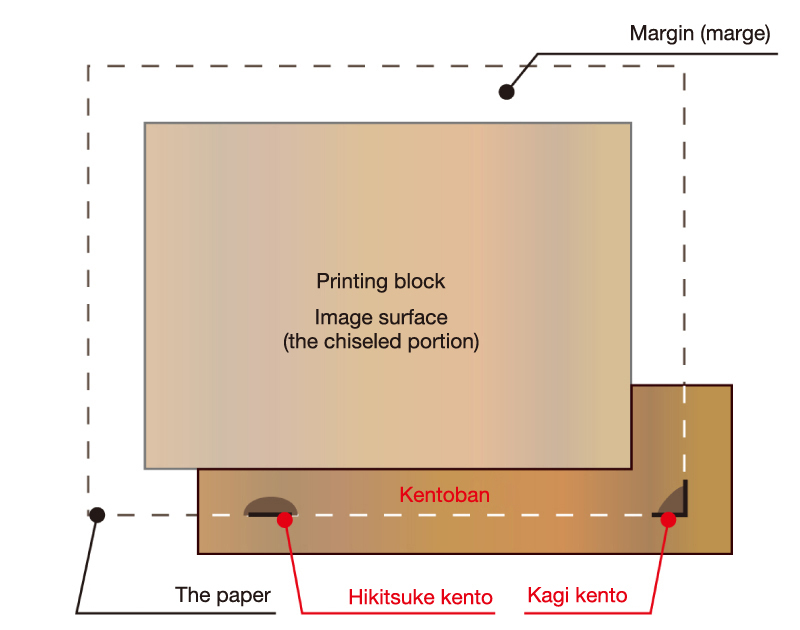 When printing, the paper is held between both hands, the part of the paper in the right hand is rested against the kagi kento and the part in the left hand is rested against the hikitsuke kento and fixed into position. The paper is then dropped gently into place on the block. If using a soto kento at this time, there is a possibility that the margins will get soiled. 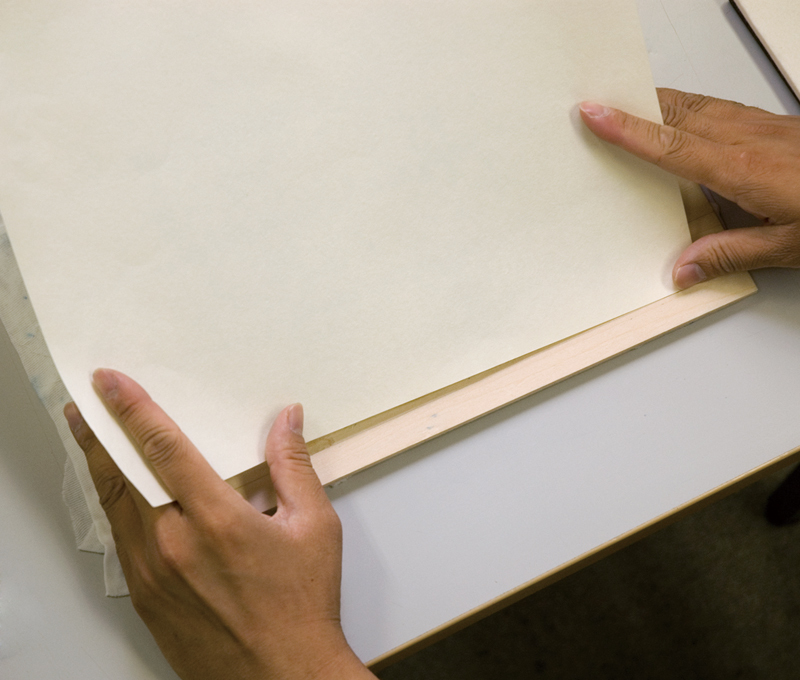 Therefore make sure to remove the soto kento after the paper is in place. Registration marks for multicolor blocks like these are said to have been perfected sometime between the mid and late 1700s and improved the technique of multicolored block prints. This later led to the emergence of prints in a rich array of colors and to the popularity of ukiyo-e.